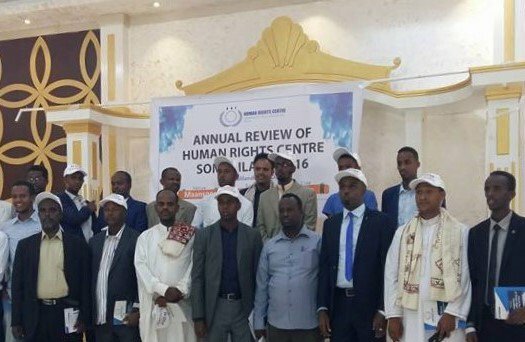 On 9 December 2016, the Human Rights Centre of Somaliland released its annual report on the human rights situation in Somaliland, covering the period from December 2015 to December 2016. The report seeks to not only criticize, but to give constructive recommendations. This year’s report denounces, among other things, the militarization of the police forces, systematic efforts to silence critical media and the unwarranted deportation of individuals. Today, 9th December 2016, the eve of the World Human Rights Day, Human Rights Centre published annual report to draw attention to the human rights situation in Somaliland. It covers the period from December 2015 to December 2016. It is being published not merely to criticise, but to make recommendations that might further enhance Somaliland’s human rights record, international reputation and build confidence with the public. Here is the summary of the report. Somaliland, a former British Protectorate, won its independence on 26 June 1960. It was recognized as an independent, sovereign state before it entered into what would become a failed union with Somalia on a flawed and dubious legal basis. The people of Somaliland, having suffered systematic discrimination and violence, decided to dissolve their failed union with Somalia on May 18, 1991 and reclaimed their independence. Since then, Somaliland has achieved peace by means of a bottom up approach, with little external help. It has built a democracy in which power changes hands peacefully in elections which are monitored internationally. It has put in place a system of governance which provides services to its people. Baseless and unwarranted deportation of individuals. This report is based on a research carried out in Hargeisa, Burao, Berbera, Boorama, Erigavo and Gebiley. From February 2016 to November 2016, we interviewed 221 people consisting of journalists, members of civil society organizations, lawyers, judges, university officials, government authorities, detainees, and members of the public. HRC visited 11 police station in Hargeisa, one police station in Erigavo and two police stations in Buroa. It also visited Gabiley, Buroa and Erigavo prisons. Cases were reviewed and examined. HRC also has a system and mechanism, including a data base, used to monitor the human rights situation in Somaliland. Somaliland often cites the freedom of the media and expression as further proof of its democratic credentials, in addition to regular multi-party elections, freedom of assembly and a record of relative peace and security in a turbulent region. However, in the past 12 months, HRC has documented detentions, beating, and harassment of journalists, as well as suspension of newspapers. The total detentions for the review period is 28 journalists compared to 19 in the same reporting period last year. Two newspapers have been closed, making a total of five closures in the past few years. Two have since been reopened. Six of the journalists detained were held on issues relating to the Berbera port project, a further eight were detained for querying land deals or transfers and two were arrested for reports over the government’s handling of devastating drought. Additionally, seven individuals were arrested after querying the agreement between Somaliland and Dubai Ports World to revamp Berbera port into a regional trade hub. The government’s sensitivity over corruption allegations in general and the Berbera port agreement in particular is further illustrated by the arrest of seven individuals for voicing opposition to the accord. HRC found that due process of law was not followed in the arrests and the procedural guidelines stipulated in the law were ignored. Illegal detentions are common. Police ill-treatment, including severe beatings, has been widely reported. The situation of the over-crowded police stations is disturbing. People are arrested and detained more than 48 hours without bringing them to court as the law requires. Remand periods are unnecessarily prolonged in a process called “Xalaalayn” (literally legitimizing). Although the Law sets out strict rules to hold a detainee at the pre-trial stage, the police bring the suspects to a judge who renew the remand period without considering the reasons of arrest, the possibility of bail and the duration reasonably needed to investigate the case depending on its nature. The police force of Somaliland is not subject to the jurisdiction of the civilian courts. In the absence of judicial oversight and accountability, they exercise and use power without recourse to the law or legal action. Victims of police actions do not have legal protection to challenge the police before civilian courts. The military courts continue to try civilian people, contrary to Somaliland constitution. HRC documented the cases of 29 civilian people tried by the military court in Hargeisa. The military court judges are military officers. The Somaliland constitution clearly prohibits military courts hearing cases in which civilians are party. Somaliland executed seven people in this year. Executions resumed in 2015 after nine years of de facto moratorium. In 2015, seven people were also executed. The constitution of Somaliland and the Penal Code allow the death penalty.